Japanese Episode AG 186: "Charge! The Stray Manyula!!" American Episode 456: "Duels of the Jungle!" While on the way to Fennel Valley, Satoshi's Aipom runs off to play in a grassy field. After getting separated from its trainer, Aipom encounters a wild Manyula and is attacked! After a fierce battle, the wild pokemon knocks Aipom out before running off. Suddenly, a ranger named Kawada appears and offers to let Satoshi take his pokemon to his hut to rest. While there, Satoshi-tachi are told that the Manyula they encountered is a stray who's been separated from its pack. Later, the Rocket-Dan come across the pokemon, and Musashi decides that she has to have it. After the Rocket-Dan attempt to catch it and fail, Satoshi-tachi arrive on the scene. Suddenly, a wild Nyula appears and has a conversation with the stray Manyula. Nyasu translates the conversation, saying that the stray Manyula used to be the leader of the pack before being ousted by another Manyula. Then, Nyula ran away from the pack because she couldn't handle being under the new leader's rule anymore. At that time, the new leader appears and tries to take Nyula back. The stray Manyula stands up to protect it and, after hearing a bit of advice from Satoshi, decides to stand tall and battle. A terrible fight begins that eventually ends with the stray Manyula winning. Now that it's been named the new ruler, the Nyula can return to its pack. With the conflict resolved, Satoshi picks his Aipom up from Kawada's hut and resumes his journey to the Battle Pyramid. After the last stinker of an episode, the anime producers give us a filler that's pretty much on-par with the fillers in Jouto. It's one of those episodes where the main cast really doesn't do anything for most of the episode, instead opting to just sit there while everything unfolds before their eyes.. I mean, yeah, Satoshi has that pep talk, and his Pikachu does take out the group of Manyula who were ganging up on the other Manyula, but other than that, they don't do squat. Kawada is also one of the most useless characters-of-the-day ever. What did he do other than provide a tiny bit of exposition, anyway? The dubbed version doesn't really stand out all that much to me. Some people accuse PUSA of making Ash act really out-of-character in this episode, but he's like that in the original version, too. Pokémon USA may be able to take the blame for a lot of things, both good and bad, but this isn't one of them. Jessie: "Aaah! 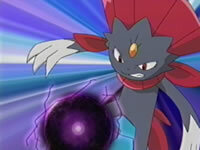 Weavile, sir, you're just a hunk-a hunk-a handsome! A-hahahahahaaa~"
James: "Jess, you wouldn't even call Giovanni 'sir'." For one thing, Musashi doesn't have that borderline zoophilic attraction to the pokemon the way Jessie does. She just calls Manyula "Manyula-sama" (-sama is a very formal way to say either Mr. or Ms. or Mrs.) and talks about how cool it is. Also, Kojirou doesn't mention Sakaki at all in the Japanese version. He just comments on how rare it is to hear Musashi attach -sama to the end of someone's name. The dub also neglects to mention the fact that the wild Nyula who shows up is a female. The Japanese version, on the other hand, does. The TO BE CONTINUED... screen is three seconds longer in the English version than it is in the dub.